An exotic, evergreen and hardy tree with mesmerising orange-red emerging leaves. 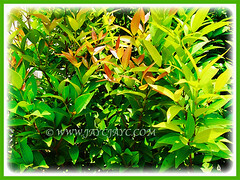 A very common tree that is often seen planted along many public roads and median strips in our beloved country, Malaysia. We love seeing these beautiful trees with autumn leaves that won’t be seen in tropical Malaysia. 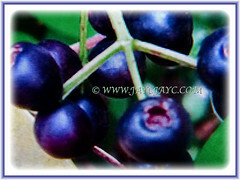 Botanical Name: Syzygium myrtifolium (syn. 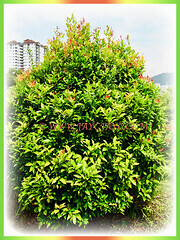 : Syzygium paniculatum, Syzygium campanulatum, Eugenia oleina, Eugenia myrtifolia). Common Names: Red Lip, Wild Cinnamon, Australian Brush Cherry, Kelat Paya/Oil in Malay. Etymology: The genus Syzygium is derived from the Greek word syzygios, alluding to the opposite paired leaves. The species epithet myrtifolium means myrtle-leaved, referring to its leaves that resemble like those of myrtle. Origin: Native to northeast India, Southeast Asia including Myanmar, Thailand, Malaysia, Singapore, Sumatra, Borneo and the Philippines. It widely cultivated elsewhere around the globe. 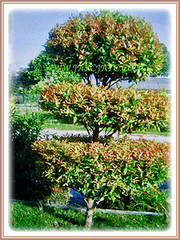 Plant type: An ornamental and perennial tree or shrub. 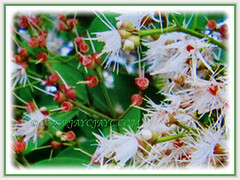 Features: Syzygium myrtifolium is from the genus Syzygium that comprises about 1200-1800 species of flowering plants. A moderate-growing and hardy tree with a dense bushy crown that can reach up to 20 m tall and spread 3-5 cm wide. When left to grow by itself, it will mature into a lovely cone-shaped or vase-shaped tree up to 10 m tall. Several stems emerge from the lower part of the tree, forming a multiple trunked tree. The woody and shrubby tree will be covered with captivating leaves that are elliptic to lanceolate in shape. The evergreen, opposite and petiolate leaves are about 7.5 cm long and 2.5 cm wide. 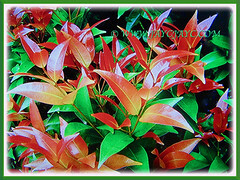 Young leaves emerge orange-red to pink, turning to yellow, pale green and maturing to a dark glossy green in colour. The aroma of the leaves is similar to cinnamon, hence Wild Cinnamon being one of its common names. Its fragrant, bisexual and powderpuff-like flowers up to 4 cm long are cream to white in colour. They are borne on a branched inflorescence. Eventually, the flowers will develop into 9 cm spherical to ellipsoid fruits that are dark purple or black berries. 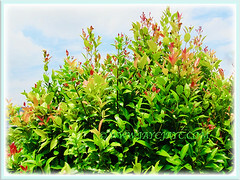 Culture (Care): Syzygium myrtifolium or Red Lip can be easily grown with least maintenance. Light: Full sun. It tolerates partial shade but will be slow-growing and produce sparser and less intense flush colouration. Moisture: Medium to high water requirements. It is drought-tolerant once established. Soil: Humus-enriched and loamy soils. It is adapted to a variety of soils, including poor soils and salt spray. Others: It responds very well to pruning into any shape or form. 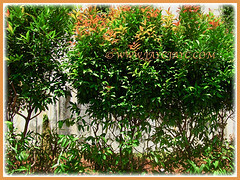 Regular trimming encourages the tree to produce colourful and new shoots in gorgeous colours of red, orange and yellow. Remember that it is sensitive to transplanting that result in fairly high mortality rate. It requires no feeding. Just provide lots of sunshine and regular watering. Generally free from serious pest and diseases. However, do watch out for eugenia psyllid and other sap-sucking insects such as scales ad whiteflies. Spray with a systemic insecticide to prevent infestation. For subtropical and temperate regions: Hardiness: USDA Zone 10-11. Syzygium myrtifolium or Red Lip is a versatile and hardy tree that is often grown in a container and placed near or on a patio and on a deck. It is definitely a bonus with its ever-changing and colourful foliage. For non-hardy regions, it is best to grow in a container to easily bring indoors during cold weather. It usually flowers in summer. Propagation: Easily propagated from seeds, stem cuttings, marcotting or air-layering. 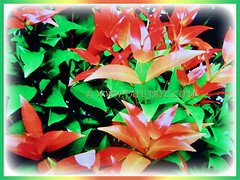 Usage: Syzygium myrtifolium or Red Lip are excellent ornamental trees with colourful autumn leaves on new growth. 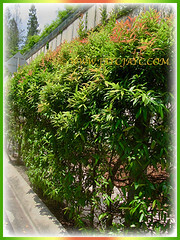 It is suitable as a landscape tree, roadside tree, at parking lots or mass planted along highway medians. They are suitable as topiaries as can be shaped into a boxed or compact form. Ideal to be sculptured into bonsai and bring indoors as a houseplant. Also suited as a dense formal hedge and screen with colour impact from the new red leaves. A versatile and hardy tree with numerous uses in the garden for shape, shelter, privacy screening and colour. Its nectar-rich flowers attract bees, wasps and butterflies while their fruits are eaten by birds.